The Wenzi (Chinese: 文子; pinyin: Wénzǐ; Wade-Giles: Wen-tzu; literally "[Book of] Master Wen"), or Tongxuan zhenjing (Chinese: 通玄真經; pinyin: Tōngxuán zhēnjīng; Wade-Giles: T'ung-hsuan chen-ching; literally "Authentic Scripture of Pervading Mystery"), is a controversial Daoist classic allegedly written by a disciple of Laozi. Two versions of the Wenzi exist; a received version, copied and transmitted over the centuries, was canonized as a Taoist text in 742 C.E. by Emperor Xuanzong of Tang, but was later declared a forgery and a plagiarism by Song dynasty (960 – 1279) scholars and subsequently marginalized. In 1973, archaeologists excavating a tomb from 55 B.C.E. discovered a Wenzi copied on bamboo strips. Ongoing sinological studies of this older Wenzi are providing both specific details of the presumed original edition and general insights into the early history of Daoist texts. The Wenzi is written in a question-and-answer format, with Wenzi as a student of Laozi in the received version, and Wenzi as a teacher of King Ping of the Zhou (周平王) in the older version. 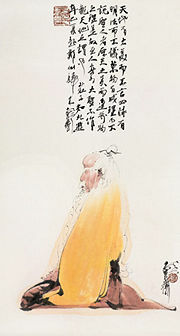 Although the Wenzi has traditionally been considered a Daoist text illustrating Laozi's thinking, it represents the "Huang-Lao" philosophy named after the legendary Huangdi (黃帝; "The Yellow Emperor") and Laozi (老子; "Master Lao"). and contains elements from Confucianism, Mohism, Legalism, and School of Names. Very little is known about Master Wen or whether he was the true author of the Wenzi. Even the name Wenzi (文子) can denote "Cultured" or "Literate," comparable with King Wen of Zhou (周文王) or Kong Wenzi (孔文子).. The early Wenzi commentary by Li Xian (李暹, fl. 516 C.E.) records that Wenzi's surname was Xin (辛) and his sobriquet (號]; hao) was Jiran (計然), he served under Fan Li (范蠡, fl. 517 B.C.E. ), and studied with Laozi. Du Daojian's commentary notes that Wenzi was a nobleman from the Spring and Autumn Period state of Jin, his surname was Xin (辛) and courtesy name (zi; 字) was Xing (銒). He was also called Song Xing (宋銒) referring to his home of Kuiqiu (葵丘), which was in Song (state). The dates of Wenzi's birth and date are unknown. The Book of Han (above) contradictorily places the lifetime of Wenzi in the eighth century B.C.E. (King Ping of Zhou) and the sixth/fifth centuries B.C.E. (Confucius, Laozi). Some commentators explain this two-century difference by proposing that there were two philosophers called Wenzi; others suggest that King Ping of Zhou was mistaken for King Ping (平王) of Chu (r. 528-516 B.C.E.). The eponymous title Wenzi (文子; "Master Wen," suffixed with -zi (子; "child; person; master (title of respect)"), is analogous with other Hundred Schools of Thought texts like Zhuangzi and Mozi. Wen (文; "written character; literature; refinement; culture") is an infrequent Chinese surname, and "Wenzi" is interpretable as a nom de plume denoting "Master of Literature/Culture." Compare the common Chinese word wenzi (文字; "characters; script; writing; written language"). In 742 C.E., Emperor Xuanzong of Tang canonized the Wenzi as a Daoist scripture (along with the Tao Te Ching, Zhuangzi, and Liezi) honorifically called the Tongxuan zhenjing (通玄真經; "Authentic Scripture of Pervading Mystery"). The emperor posthumously styled Wenzi as the Tongxuan Zhenren (通玄真人; "Authentic Person of Pervading Mystery"). Written references to the Wenzi first appear in the Han Dynasty. The no longer extant first century B.C.E. Qilue (七略; "Seven Summaries") by Liu Xiang and Liu Xin said the Wenzi had 9 pian (篇; "chapters"). The bibliographical section of the first century C.E. Book of Han records the Wenzi text in 9 juan (卷; "rolls; volumes"), says that Wenzi was a student of Laozi, a contemporary of Confucius (551-479 B.C.E. ), and adviser to King Ping of Zhou (r. 770-720 B.C.E. ), but adds "the work appears to be a forgery." In his ca. 523 C.E. Qilu (七录錄; "Seven Records"), the Liang Dynasty scholar Ruan Xiaoxu (阮孝绪) records the Wenzi text as being ten volumes. Bibliographies in the 636 C.E. Book of Sui and the 945 C.E. New Book of Tang both record 12 volumes. The Daozang "Daoist Canon" includes three Wenzi redactions under the Yujue (玉訣; "Commentaries") subsection of the Dongshen (洞神; "Spirit Grotto") section. The oldest extant edition is the Tongxuan zhenjing zhu (通玄真經注; "Commentary on the Authentic Scripture of Pervading Mystery") by Xu Lingfu (徐灵府, ca. 760-841) of the Tang Dynasty. The Tongxuan zhenjing zhenyi zhu (通玄真經正儀注; "Commentary on the Correct Meaning of the Authentic Scripture of Pervading Mystery") is by Zhu Bian (朱弁, ca. 1085-1144) of the Song Dynasty. Third is the 1310 C.E. Tongxuan zhenjing zuanyi (通玄真經纘義; "Collected Explanations to the Authentic Scripture of Pervading Mystery") by Du Daojian (杜道坚, 1237-1318) of the Yuan Dynasty. In the opinion of Siku Quanshu bibliographers, Du's version was the most reliable Wenzi redaction. Du Daojian became the rightful literary heir to Wenzi when he discovered a copy of the classic at the Tongxuan Guan (通玄觀 "Abbey of Pervading Mystery") of Mount Jizhou (計籌) in Zhejiang, where hagiographic legend says Wenzi took refuge and wrote down his teachings. Although the Wenzi has traditionally been considered a Taoist text illustrating Laozi's thinking, it represents the "Huang-Lao" philosophy named after the legendary Huangdi (黃帝; "The Yellow Emperor") and Laozi 老子 "Master Lao." which largely disappeared after Emperor Wu of Han (r. 141-87 B.C.E.) declared Confucianism the official state philosophy. The Wenzi contains elements from Confucianism, Mohism, Legalism, and School of Names, and bears many similarities to the Huainanzi, a second century B.C.E. philosophical classic from the Han dynasty. While these references make the Wenzi appear as a source of ancient thought, in the form we know it today it is a forgery, with about 80 percent of the text quoted from the Huainan zi, and the rest consisting of an amplification of the Dao De Jing or quotations from other texts. The present version contains expression similar to those found in the Taoist scriptures … These elements suffice to show that the extant Wenzi was written between the third and eighth centuries, before the time of Xu Lingfu. In 1973, Chinese archeologists excavated a Han Dynasty tomb near Dingzhou (定州; or Dingxian, 定縣) in Hebei. Its occupant is identified as King Huai (懷王) of Zhongshan (state), who died in 55 B.C.E. The tomb furnishings included a precious Jade burial suit, jade ornaments, writing tools, and remnants of eight Chinese classic texts, including the Wenzi and Confucian Analects copied on hundreds of bamboo slips (簡; jian, "bamboo slip/strip; simple"). These bamboo manuscripts were fragmented, disordered, and blackened by fire, perhaps accidentally caused by tomb robbers. The Yinqueshan Han Slips and the Guodian Chu Slips are comparable examples of bamboo strips used as writing tablets. The specialized project of deciphering and transcribing this ancient copy of the Wenzi was delayed by a 1976 earthquake at Tangshan that further damaged the Dingzhou bamboo slips. The team published their first report in 1981 and their Wenzi transcription in 1995 (both in the archeological journal Wenwu 文物 "Cultural Relics" in Chinese)). Consensus is building that this excavated Wenzi dates from the early second century B.C.E., while the transmitted text was repeatedly corrupted by copyists and amended by editors. Ongoing sinological studies of this so-called Dingzhou Wenzi are providing both specific details of the presumed urtext edition (original edition) and general insights into the early history of Taoist texts. Portions of the Dingzhou Wenzi are basically consistent with 6 of the 12 chapters in the received text. There is a significant difference between the question-and-answer format of the bamboo and received Wenzi versions. The older bamboo version has Wenzi as teacher being asked questions by a King Ping of the Zhou (周平王), a format consistent with the court bibliography in the History of the Han (111 C.E.). The received text has the teacher Laozi (老子) being asked questions by the student Wenzi. Since texts are usually named for the teacher rather than the student, the older format seems more appropriate. Through the ages, Chinese scholars have debated the authenticity of the Wenzi, which purports to be the creation of a disciple of Laozi, the alleged founder of Daoism. Until the Tang dynasty, scholars accepted that the text was literally authored by a disciple of Laozi. Scholars of the Song dynasty, pointing out several elements in the text that were clearly written later than the sixth century B.C.E. when Laozi and Wenzi were supposed to have lived, labeled the Wenzi a forgery and a plagiarism. From the Song dynasty onwards, the Wenzi received little attention. In 1973, the discovery of a bamboo manuscript of the Wenzi dating to 55 B.C.E. led to the text being re-classified as an important artifact of China's philosophical heritage and a genuine pre-Qín work. The debate over the authenticity and importance of the Wenzi continues. Many of the ancient Chinese texts attributed to specific philosophers and religious founders were in fact compiled much later by anonymous authors. The question-and-answer format of the Wenzi is a device commonly employed for teaching, and does not imply that such a discussion actually took place. The changes in the content of the Wenzi that occurred over the centuries reflect the philosophical trends that were current at different times in Chinese history. There is no authoritative English Wenzi translation based on the groundbreaking Dingzhou readings, nothing comparable with the Analects translation by Ames and Rosemont (1998). The closest is the unpublished PhD dissertation of Paul van Els (2006). ↑ Randal P. Peerenboom, Law and Morality in Ancient China: the Silk Manuscripts of Huang-Lao. (State University New York (SUNY) Press. 1995). ↑ Paul Van Els, The Wenzi: creation and manipulation of a Chinese philosophical text. PhD dissertation. Leiden University. 2006. ↑ Paul van Els, The Date of the Proto-Wenzi WSWG 17, Leiden University September 18, 2003, Retrieved January 19, 2009. ↑ Thomas Cleary, tr. Wen-tzu: Understanding the Mysteries, Further Teachings of Lao-tzu. Shambhala. 1991. Ho, Che Wah. "On the Questionable Nature of the Texts Found in Lushi Chunqiu and the Plagiarizing Relationship between the Huainanzi and the Wenzi," Journal of Chinese Studies 11:497-535. 2002. Le Blanc, Charles. Le Wen zi à la lumière de l'histoire et de l'archéologie. Montreal: Presses de l'Université de Montréal, 2000. Van Els, Paul. The Wenzi: creation and manipulation of a Chinese philosophical text. PhD dissertation. Leiden University. 2006. This page was last modified on 8 August 2013, at 14:30.